Pendley's Model 2290 uses a 350-horsepower CAT engine to process the material he clears from his properties. 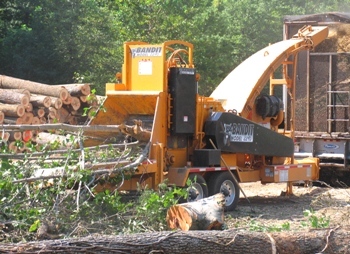 The 24.5 x 26-inch chipper opening and powerful infeed make short work of the limby material and ragged treetops he often encounters, and the chip quality is such that he doesn't have a problem finding customers for his end product. "The chip is really uniform," he said. "I've got 11 loads chipped on the current knives and I haven't set the anvil for the last 25-30 loads. I work with a couple paper companies that are awfully strong; I've got one that does a real good job buying all the products that I can put out, and I've got a mulching company that I sell to. I also sell mulch on the side, so I've got plenty of market for my material." Prior to the 2290, he was using a competitor's horizontal grinder that was neither well-suited for his work nor very reliable. "It didn't load the trailer," explained Pendley. "It dropped it off on the ground, then you had to build a load ramp, and when you're in the woods you don't have as much room to do all that. It also had four bearings go out within 200 hours of use, costing me time and money. In this day and age, time and money are everything." All in all, Pendley's Model 2290 is performing at or beyond his expectations. "I can load a 45-foot trailer and I've got a curtain on the front to keep from damaging the front wall of the trailer because it throws so hard," he said. "It's efficient; I get about 11 gallons an hour, or about 32 tons of material. The feed system is super, the wear and tear is real good, and the sales and service is fantastic." Though he doesn't have any official plans to expand his current business, upgrading to a larger chipper isn't out the question. Should that time come, Pendley says he would stick with Bandit Industries. "I may go to a 3590," he says with a grin. 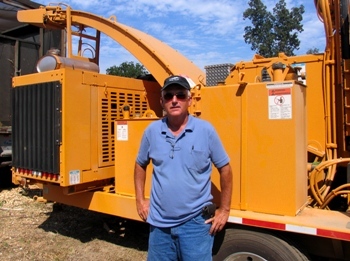 "Overall, Bandit chippers are built heavy and good—I definitely recommend them to others."